Encourages frequent breaks from your computer. Is there a better alternative to Pauses? Is Pauses really the best app in Health and Fitness category? Will Pauses work good on macOS 10.13.4? Pauses is a small application that runs in the background while you work and helps you take regular pauses from working on your computer. Pauses is designed to be as non-intrusive or as intrusive as you want it to be. Want it to force you to take a pause? It can do that. Want it to let you skip pauses freely? It can do that too. Pauses When You Want Them : Quickly enable or disable Pauses, start a pause at any time from the menu bar or the Dock, and reschedule and skip pauses at will. Pauses needs a review. Be the first to review this app and get the discussion started! Pauses needs a rating. Be the first to rate this app and get the discussion started! Forced Pauses : Need a little motivation to take regular pauses? Pauses is here to help. Set a maximum number of allowed pause skips per day or disable pause skipping and/or rescheduling altogether. Your call. Notifications : Make sure you aren't taken by surprise by using Pauses' notifications. 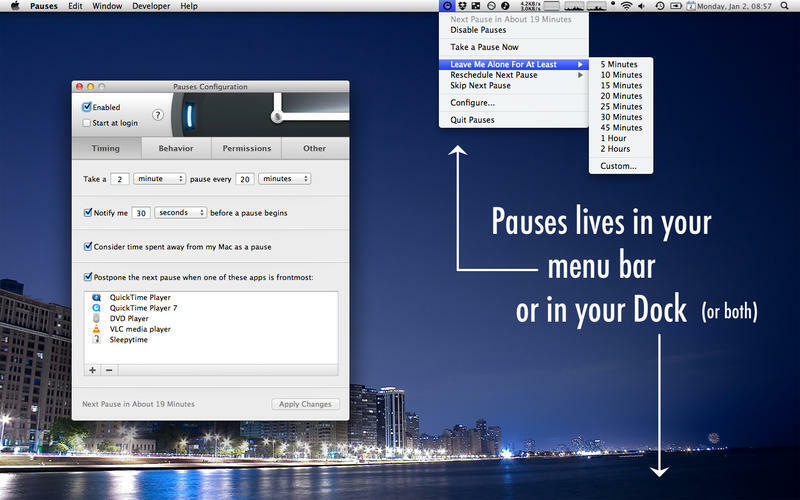 By default, Pauses notifies you 30 seconds before a pause starts so that you have time to finish what you are doing. Notifications are displayed using Growl. Notes : Pauses can help you remember what you were doing before your pause so that you can regain maximum focus as quickly as possible when your pause ends. No need to think about your work while you take your pause. Out of sight, out of mind. Automatic Rescheduling : With Pauses' automatic rescheduling, you will never be prompted to take a pause when you've already been away from your computer for a while. Pauses intelligently reschedules your next pause when it notices you've been away. App-Based Pause Postponing : You will never need to disable Pauses to be left alone when you watch a movie or want to work uninterrupted in a specific app. Pauses can automatically postpone your next pause when specific apps are frontmost. Choose which! iTunes Control : Pauses is able to pause iTunes or have it play a playlist of your choice for the duration of your pause. For example, you can listen to upbeat music while working and let Pauses take over playing zen music when the time comes to take your pause. A Little Inspiration : Pauses displays inspiring quotes in its pause screen. What better way to free your mind and relax than to take it somewhere else? Menu Bar or Dock (or Both) : Your menu bar is already cluttered with dozens of apps? You can tell Pauses to reside in the Dock only. Want to de-clutter your Dock instead? You can have Pauses reside in the menu bar only. Or why not both at the same time?